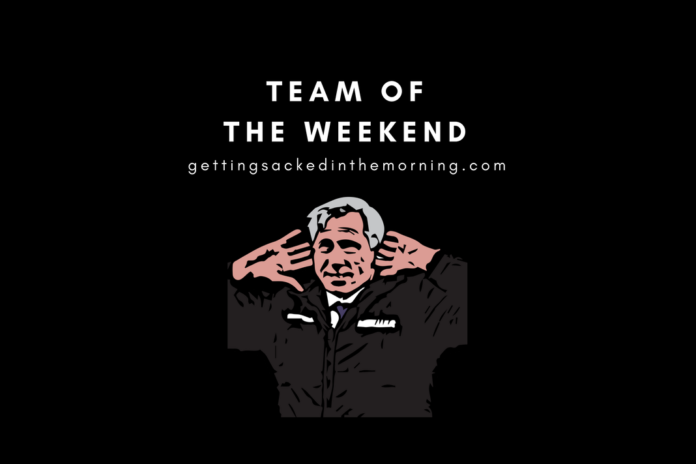 Another great weekend of Premier League action has left us with a selection dilemma. 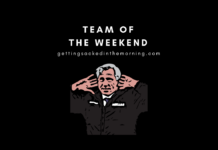 Team of the Weekend celebrates the best and worst of the action but with so much incident to get through, I can barely afford to waste words on an introduction. So, who made the cut? Sergio Rico – There was a lack of goalkeeping incident this weekend so I’ve given the gloves to Fulham’s Sergio Rico. This is a brave move given most of his performances this season. A very rare clean sheet and a win though is worth celebrating as Fulham’s stay in the top flight meanders to a close. Matt Ritchie – Although Ayoze Perez was the match winner for Newcastle on Friday, I want to talk about Matt Ritchie. Here we have a winger who has been converted to a wingback and has not looked out of place at all. His delivery will always lead to assists and his cross from open play was met by Perez for the winning goal. Great commitment and energy made him an ideal candidate for the wing back role and he’s done so well to adapt. Joe Bennett – You could say Cardiff came away empty-handed on Saturday. Not everybody did though. Joe Bennett pulled. Ashley Barnes took shithousery to a whole new level by kissing Bennett on the nose – twice. Bennett earned his place in the team this week for having to go through that and for managing to not retaliate. 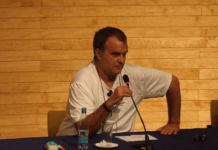 Luka Milivojevic – I’m going full-on Garth Crooks and putting Milivojevic in as a defender. Remember when Frank De Boer tried him as a centre half? Odd times. Anyway, Luka showed his versatility this week by scoring a free kick instead of a penalty. As we know, scoring a free kick guarantees you a selection in team of the weekend. Nathan Redmond – Remember when Pep Guardiola had a nice little chat with Nathan Redmond? Whatever he said, it seems to have been taken on board. Redmond has flourished under Hasenhuttl and his two goals against Wolves basically guaranteed Premier League football next season. I wouldn’t be surprised to see him in the England squad either. Anthony Knockaert – What an awful tackle. One of the worst? A forward’s tackle? Dress it up however you like, this was abysmal and a three-match ban hardly seems enough. Ryan Fraser – This little lad just keeps getting better and better. The trio of Wilson, Brooks and Fraser have really caught the eye this season. They were borderline bullying Brighton by the end and Fraser came away with a goal and two assists. The media are desperate to sell Bournemouth’s better players to “bigger” clubs and on this form, he wouldn’t look out of place. Paul Pogba – I have rarely seen a midfield player be less effective in play yet come away with man of the match. He took his two pens well, I’ll give him that. Outside of that though Pogba contributed very little on a strange old evening in Manchester. Solskjaer remains a very lucky manager. Lucas Moura – Hat-trick! Huddersfield played every bit like a relegated team but Moura took his goals incredibly well. His place in the team was always going to be secured with the hat-trick but if your heart didn’t melt during the post-match kick about with his son then are you really human? Raheem Sterling – Two more for the Raheem machine. His first was an excellent finish, similar to Aguero’s against Fulham a few weeks ago. We’ve seen Sterling go from very good to world class this season in my view and the quadruple dreams are still alive. It’s a Tottenham double up next. Mo Salah – That was some hit, wasn’t it? Liverpool kept their title hopes alive with a fine win against Chelsea. Salah’s goal came just minutes after the opener. An already rowdy Anfield erupted at the sight of Salah unleashing that left foot from fully 30 yards. He managed to blot his copybook earlier in the day with a terrible dive. Jurgen Klopp – A huge win for Liverpool earns Klopp a position in the dugout this weekend. With all the history around fixtures with Chelsea there’s a lot to be said for the way Klopp had his team prepared for this one. Liverpool’s title hopes are not in their own hands but all they can do is keep winning. 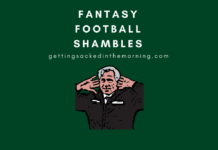 This was seen as the last hurdle in the way of Liverpool finishing the season with consecutive wins and with that negotiated, it should shift the pressure to Man City. That’s all from a thoroughly entertaining weekend but I’ll be back next weekend with more of the same. Toodles! Previous articleAre we still blaming Mohamed Salah for being rubbish this season?